Packard Annex is a picture, with genre photograph. Its dimensions are 3.25 in. x 4.75 in.. It was created in 1960. The building pictured here, known as the Annex, was built in 1916 on the school farm lot. 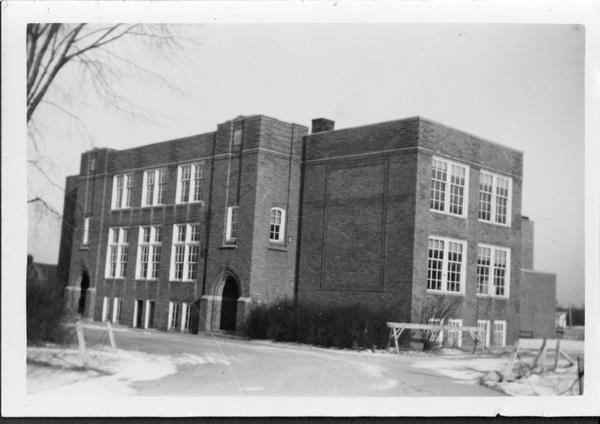 It was Worthington’s high school until 1952 when a new high school was built just to the west to accommodate the population boom after World War II. The Annex was designed by Columbus architect Frank Packard, a prolific designer whose local buildings include Franklin County Memorial Hall, Orton Hall at OSU, Jeffrey Mansion in Bexley and the Broad Street Presbyterian Church. The Annex is the current site of the Peggy R. McConnell Arts Center. It covers the topics school buildings, Packard Annex and buildings. It features the organizations Peggy R. McConnell Arts Center and Thomas Worthington High School. The Worthington Memory identification code is wsa0046. This metadata record was human prepared by Worthington Libraries on February 24, 2003. It was last updated June 5, 2018.